Our hostel is situated just by the harbour, next to Käringön Hotell. We have 16 beds on the ground floor, divided in two two-bed rooms and three four-bed rooms. All with bunkbeds and shared bathroom in the corridor. When staying at the hostel you have access to two shared kitchens and a lovely glazed veranda with a beautiful view overlooking the harbour. Upstairs you can rent our two large apartments. Both including two separate bedrooms, a total of six beds, a bathroom with shower, washing machine, tv area, kitchen and a big balcony. When staying at our hostel or in the apartments you are welcome to rent sheets from us and add a delicious hotel breakfast in our restaurant, if you like. 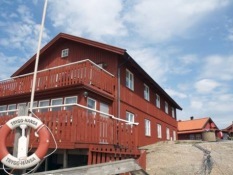 The hostel, Seglarhotellet , was opened in the new house Skippers House in June 2015. 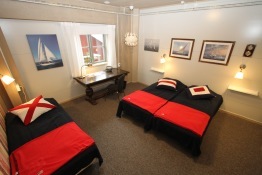 The room are spacious and hold high standard, due to beds, furniture and equipment. Every room is equipped with a television set. 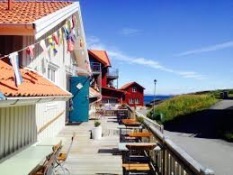 The hostel is located just 150 meters from the beach and the harbor with shops and restaurants are close by. The hostel has got seven rooms, five double room and two three bedroom. There is common area with a small kitchen, and in front of the hostel there is large terrace with furniture to enjoy the sun. Bring your own sheets or rent. Breakfast can be ordered.